Sam and Dean dealing with a kissing curse? Must be Valentine’s Day. And what about that bro moment at the very end? 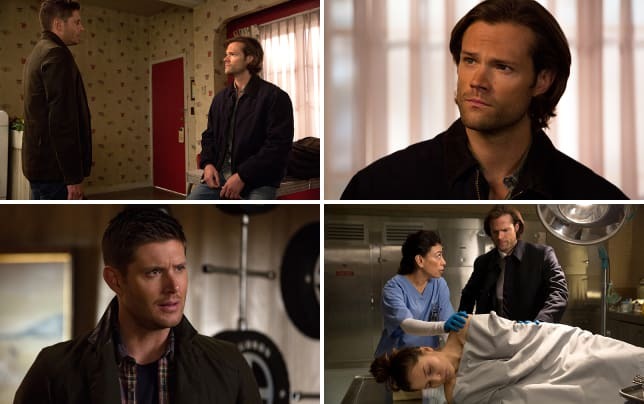 TV Fanatic staff writers Sean McKenna and Christine Laskodi and The Winchester Family Business’ Alice and Nightsky are talking all about Supernatural Season 11 Episode 13. So make a date with the Supernatural Round Table to talk about “Love Hurts,” and find out what holiday-themed episode the panelists hope Supernatural does next! Christine: That epic moment at the end for Sam and Dean. It made the rest of the hour worth sitting through. Dean's confession to Sam was incredible, but Sam's reaction was even better. Anytime that Dean humbles himself and asks for help is always a great scene, but here, this was like another level of their brotherly bond. I loved it. You went to Sam and Dean with your strange story and you’re freaked out by them? 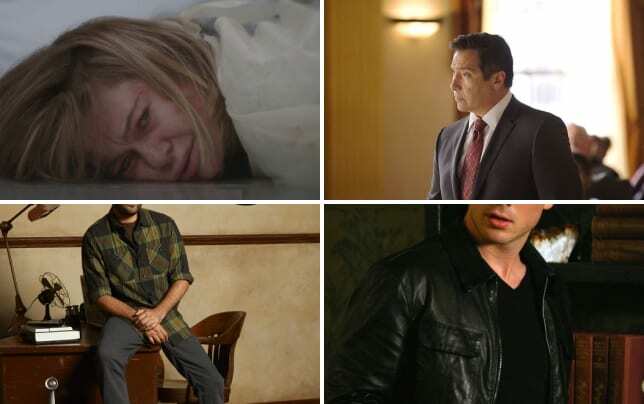 I really, really think these people that the Winchesters run into watch a little too much X-Files. They buy the “G-men who hunt spooky things” act too easily. She should have figured out they weren’t legit in five minutes. Nightsky: Without a doubt, the broment at the end of the episode. Dean accepting his own feelings enough to be able to admit them aloud to his brother was a real breakthrough and Sam’s reaction was better than I could have imagined. It showed real growth and maturity from both brothers. Sean: Yeah, I’d probably have to agree with that last brother moment, too. But I’ll pick Sam and Dean playing rock, paper, scissors. They are always on such serious and deadly cases, but it’s great for them to have a little humor and fun while on the job. Christine: I wasn't into it. The characters were bland, the witch was forgettable. But the Qareen was a nice touch. At least there was something new and interesting there. Alice: The witch? I hated her. It’s too bad too because the whole story went well until she showed up. Another cardboard cutout villain with the ambiguous motive that only exists so she can mustache twist her devious plan via excessive monologuing in front of a captive Sam. All I kept thinking was, “How is this useless woman going to meet her gory end?” It just wasn’t soon enough. Just like with vampires, Supernatural sorely needs to stay away from witches as MOTW. Nightsky: I was frankly very surprised the season returned to witchcraft as a theme. I am suspicious that their reprised emphasis on curses and spells foreshadows the direction they will go to solve the Lucifer and/or Amara problem. As far as the execution of this particular monster (a witch and Qareen), I thought the reanimated killers were all fabulous. I had to close my eyes when the dead dad kept tauntingly knocking on his house door, and vengeful Stacy was truly eerie! Phil Sgriccia’s talented directing really made this episode work in a Hitchcock kind of way. The witch herself was a bit weak. Her sob story wasn’t convincing and fell flat for me. Sean: I didn’t dislike the witch as much, but I totally get what you are all saying. But really, the thing that bugged me about the case was how close it felt to the movie “It Follows.” I really did hope that was more of an homage to the movie rather than just a copy. How often do you use the game rock, paper, scissors to make decisions? Christine: Sadly, at least once a week. No shame. I'm usually wearing a Snuggie while I use the game, too. Alice: I confess, I have no freaking clue how rock, paper, scissors works. Never done it. However, I do have a pretty good grasp of rock, paper, scissors, lizard, Spock. That game is truly a no win situation. Nightsky: Uh, never? It was fun seeing the boys do it again, though. That small moment of them being teasing brothers counterbalanced them facing very tough realities about their weaknesses and the fate of the world just moments later. Sean: It should be more often! It’s just a fun and quick way to get decisions made, obviously. Were you glad Dean finally talked to Sam about Amara? Christine: So glad. I've been shaking my head for weeks now about what was holding Dean back. I think the realization that Amara is his deepest desire shook him up. Dean needed to see that in order to realize just how deep he was in with God's sister. Alice: Ecstatic! It’s finally out in the open! It wasn’t a big, overblown dramatic moment either. 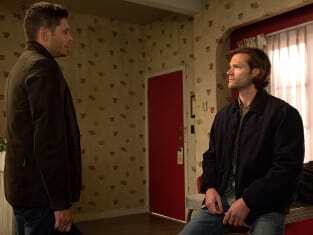 Dean told Sam the truth and Sam rationally listened and asked rational questions. It was a very adult discussion. But just as we were lulled into this false sense of security, the camera closes in on the classic “gaze of Winchester worry.” This time, it’s Sam. He may have talked a good game but oh yeah, he’s freaked. Foreshadowing with a capital F! It’s a classic tactic for an episode 13, when we have 12 more episodes in the season for this to play out. They’re reminding us something still isn’t right. Nightsky: Glad doesn’t being to cover it! Hallelujah! It reaffirmed my (and their) faith in their bond, and finally, finally reflected the personal growth that was promised from the past few years of unending, tiresome turmoil between them. That conversation also moved the season’s myth arc forward, which to me is a sign of the cohesive plot planning and skillfully executed writing that keeps the audience engaged. Sean: It was fantastic, and whether he was going to tell has been a question we’ve all been wondering. But it was a great moment not just because Dean came out to admit the “desire” with the Darkness, but also in the way Sam reacted. I agree, it was a very adult conversation that never got overblown. It’s awesome to see that. What other holiday would you want to see Supernatural base an episode around? Christine: Easter, easily. Easter Bunnies are scary as hell. Just look at any of my baby photos from the mall with the dreaded fuzzy bunny man, and you'll see. Alice: Groundhog Day. This time, Sam gets to die over and over again. Nightsky: St. Patrick’s Day could be hilarious. I would love to see Dean deal with leprechauns running around everywhere! A sentimental Fourth of July episode might also be sweet, as Dean and hopefully Sam remember the fireworks moment of their youth. Sean: Those are all great choices. I definitely think a St. Patrick’s Day one would be fun. Beer and leprechauns? Sounds right up Sam and Dean’s alley.